To catch up an industry standard, Disney had unique problems to solve. Approximately 12% adoption rate and 20% check average increase were seen since launch. Additional 22 restaurants were convinced to join the feature-capable list. Later on, we split and each owned parts of the flow/problems specified below. I also led the prototyping team for usability test. Before the official kick-off meeting, I held consecutive design workshops to do problem statement and task model exercises to help the team quickly ramp up. 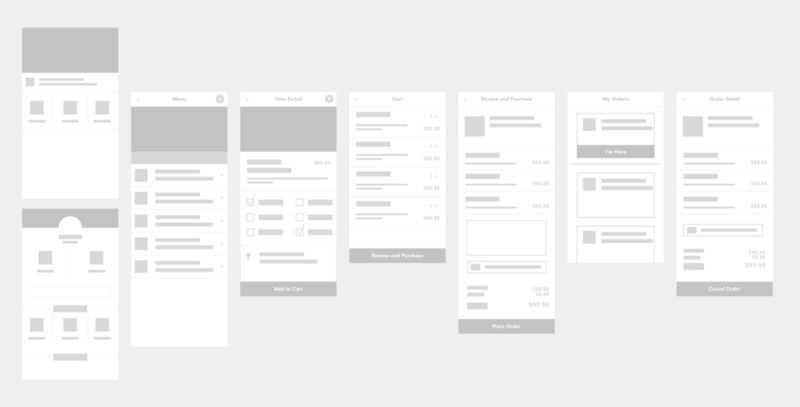 Wireframes I did during the early stages of design. The style doesn't get too into the details but leverages patterns from Disney's existing design system. Offering customization options for items users are ordering is one of the most anticipated feature from early user research. The interface needs to carry the function of not only showing the options but also informing some options are with extra cost. Here are some explorations I did with common design controls and existing patterns from the design system. After reviewing with other designers, we agreed that none of them are scalable to achieve simplicity, discoverability and easy of use for all possible customizable items data sets. Instead of calling out all the options for each item, the server only says the default choices, and have the guest continue to engage the interaction based on his/her interest. Because it's a new pattern, a couple of nuance motions were added to build stronger connection between the status label and the selection buttons. Based on the established business rules, users' notification center will be flooded with messages from each individual restaurant. I created a comparison visualization showing how it happens and what the recommendation is. It successfully raised our PM's concern and ended up changing the business rules. I led a team of 5 designers, set up daily check-ins, architected the framework , and made timelines and task sheets to make sure we meet the deadline. Motion specifications along with the demo to help communicate detailed animation/motion to engineers.